Earlier this year I joined a CSA (one of my better decisions of the year) and one of the many perks is having the opportunity to cruise through a genuine pumpkin patch and choose 3 pumpkins of any size to take home. It was drizzling outside and a bit chilly but we all enjoyed ourselves nonetheless...we just made it a semi-quick outing! Here are a few pics from our day. The kids were SO excited. The bottom left picture is of L. hugging a little girl (he likes to give hugs) whose identity is unknown :). I asked L. and E. to give each other a hug for the picture and L. ran towards this nearby little girl and opted to hug her instead. Silly little guy. 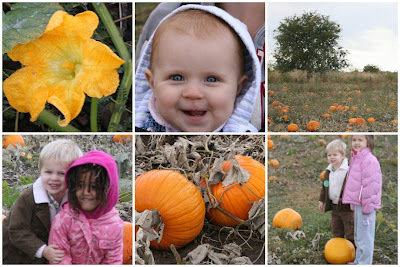 I'd say my grandkids were the cutest little punkins in the patch!